This study demonstrated the feasibility and advantages of a hybrid, volumetric arc therapy technique that used two 90° coplanar arcs and two three-dimensional conformal tangential beams in the simultaneous-integrated boost radiotherapy of left-sided breast cancer after breast-conserving surgery. A total of nine patients with stage I, left-sided breast cancer who underwent breast-conserving surgery were selected for this retrospective study. 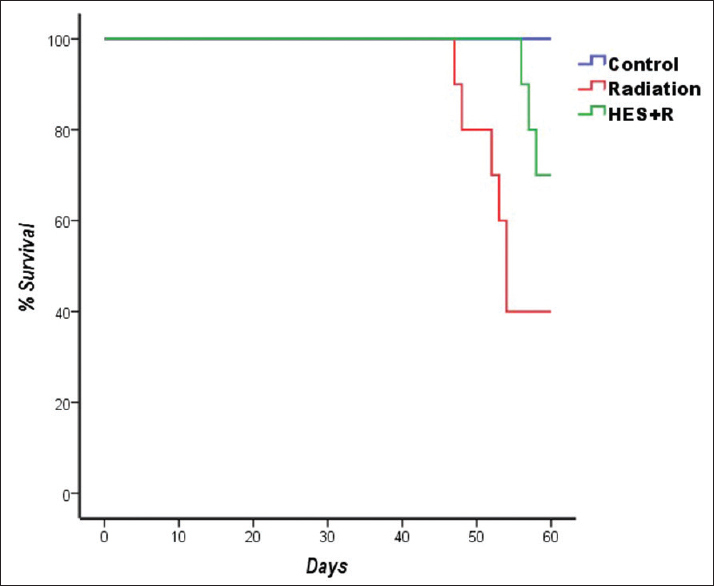 For each patient, a hybrid arc plan was generated and then compared with two hybrid intensity-modulated radiotherapy plans. All plans were optimized using the same objectives and dose constraints. The prescription dose was 50.4 Gy to the planning target volume with simultaneous boost to 60 Gy to the expanded gross target volume in 28 fractions. The differences among these hybrid plans were analyzed by the Kolmogorov–Smirnov test or the Wilcoxon rank sum test. The hybrid arc plans achieved the clinical requirements of target dose coverage and normal tissue (NT) dose constraints. It was found that the hybrid arc plans showed advantages in the conformity index of the expanded gross target volume, the V5of the heart, the D2of the left ventricle, and the D2and V50.4of NTs. The average beam-on time and monitor units of the hybrid arc plans were significantly lower (P < 0.001). Advanced radiotherapy modalities such as stereotactic radiosurgery (SRS) and image-guided radiotherapy may employ very small beam apertures for accurate localized high dose to target. Accurate measurement of small radiation fields is a well-known challenge for many dosimeters. The purpose of this study was to measure total scatter factors for stereotactic cones with plastic scintillation detector and its comparison against diode detector and theoretical estimates. 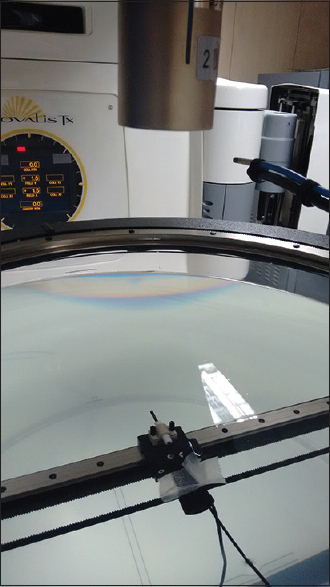 Measurements were performed on Novalis Tx™ linear accelerator for 6MV SRS beam with stereotactic cones of diameter 6 mm, 7.5 mm, 10 mm, 12.5 mm, and 15 mm. The advantage of plastic scintillator detector is in its energy dependence. The total scatter factor was measured in water at the depth of dose maximum. Total scatter factor with plastic scintillation detector was determined by normalizing the readings to field size of 10 cm × 10 cm. To overcome energy dependence of diode detector for the determination of scatter factor with diode detector, daisy chaining method was used. The plastic scintillator detector was calibrated against the ionization chamber, and the reproducibility in the measured doses was found to be within ± 1%. Total scatter factor measured with plastic scintillation detector was 0.728 ± 0.3, 0.783 ± 0.05, 0.866 ± 0.55, 0.885 ± 0.5, and 0.910 ± 0.06 for cone sizes of 6 mm, 7.5 mm, 10 mm, 12.5 mm, and 15 mm, respectively. Total scatter factor measured with diode detector was 0.733 ± 0.03, 0.782 ± 0.02, 0.834 ± 0.07, 0.854 ± 0.02, and 0.872 ± 0.02 for cone sizes of 6 mm, 7.5 mm, 10 mm, 12.5 mm, and 15 mm, respectively. The variation in the measurement of total scatter factor with published Monte Carlo data was found to be −1.3%, 1.9%, −0.4%, and 0.4% for cone sizes of 7.5 mm, 10 mm, 12.5 mm, and 15 mm, respectively. We conclude that total scatter factor measurements for stereotactic cones can be adequately carried out with a plastic scintillation detector. Our results show a high level of consistency within our data and compared well with published data. The aim of this study was to evaluate the impact of conformity index in the unified dosimetry index (UDI) score for two different planning techniques namely intensity-modulated radiotherapy (IMRT) and Rapid Arc. 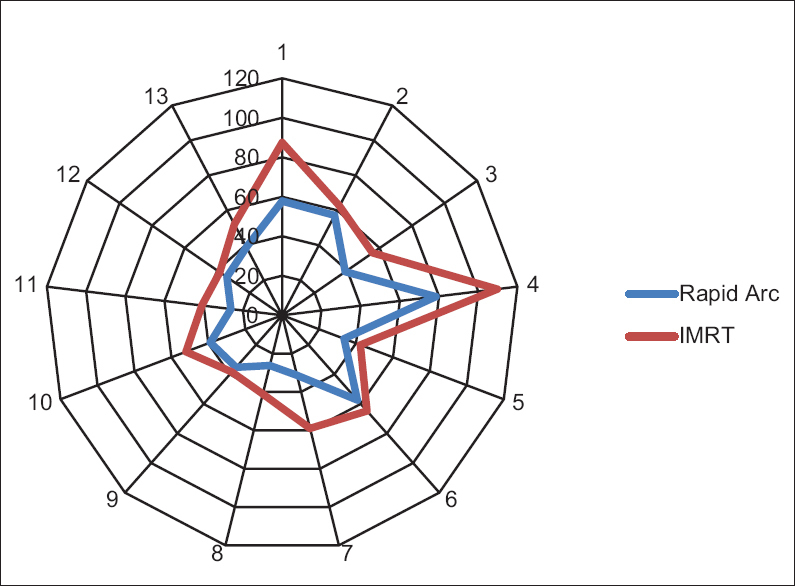 Rapid Arc and IMRT plans of 57 patients were evaluated and compared using UDI score which incorporates four indices. To determine the impact of conformity index on the IMRT and Rapid Arc plans, UDI at conformity index one of all plan (UDIunit_CI) score was calculated by assuming conformity index is equal to one. Mean and standard deviations of all indices were calculated. Rapid Arc technique plans of different treatment sites of all patients scored lesser UDI than IMRT plans, and the conformity index of Rapid Arc plan was significantly better than IMRT plan. The average dose gradient, homogeneity, coverage, and conformity index of all sites with Rapid Arc plans were 0.212 ± 0.05, 1.123 ± 0.03, 0.959 ± 0.03, and 1.056 ± 0.09; with IMRT plans were 0.190 ± 0.05, 1.113 ± 0.04, 0.950 ± 0.04, and 1.172 ± 0.16, respectively. UDI score value with actual conformity index of Rapid Arc and IMRT plans differed significantly (P < 0.001). However, UDIunit_CIscore values with assumed conformity index equal to one did not differ significantly (P = 0.528). In the comparison of IMRT and Rapid Arc plans using the UDI score, the impact of conformity index was significant. 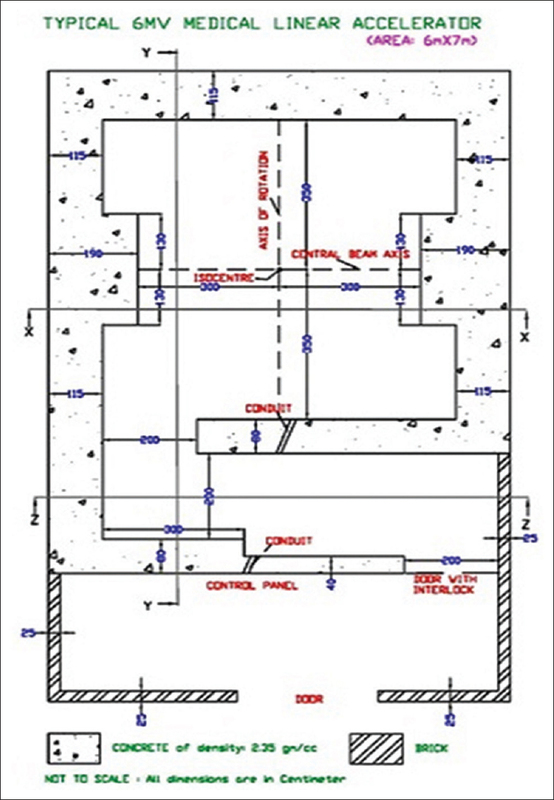 Detailed structural shielding of primary and secondary barriers for a 6 MV medical linear accelerator (LINAC) operated with flattening filter (FF) and flattening filter free (FFF) modes are calculated. The calculations have been carried out by two methods, one using the approach given in National Council on Radiation Protection (NCRP) Report No. 151 and the other based on the monitor units (MUs) delivered in clinical practice. Radiation survey of the installations was also carried out. NCRP approach suggests that the primary and secondary barrier thicknesses are higher by 24% and 26%. respectively, for a LINAC operated in FF mode to that of a LINAC operated in both FF and FFF modes with an assumption that only 20% of the workload is shared in FFF mode. Primary and secondary barrier thicknesses calculated from MUs delivered on clinical practice method also show the same trend and are higher by 20% and 19%, respectively, for a LINAC operated in FF mode to that of a LINAC operated in both FF and FFF modes. Overall, the barrier thickness for a LINAC operated in FF mode is higher about 20% to that of a LINAC operated in both FF and FFF modes. Reactive oxygen species (ROS) are generated by ionizing radiation, and one of the organs commonly affected by ROS is the lung. Radiation-induced lung injury including pneumonia and lung fibrosis is a dose-limiting factor in radiotherapy (RT) of patients with thorax irradiation. Administration of antioxidants has been proved to protect against ROS. The present study was aimed to assess the protective effect of hesperidin (HES) against radiation-induced lung injury of male rats. Fifty rats were divided into three groups. G1: Received no HES and radiation (sham). G2: Underwent γ-irradiation to the thorax. G3: Received HES and underwent γ-irradiation. The rats were exposed to a single dose of 18 Gy using cobalt-60 unit and were administered HES (100 mg/kg) for 7 days before irradiation. Histopathological analysis was performed 24 h and 8 weeks after RT. Histopathological results in 24 h showed radiation-induced inflammation and presence of more inflammatory cells as compared to G1 (P < 0.05). Administration of HES significantly decreased such an effect when compared to G2 (P < 0.05). Histopathological evaluation in 8 weeks showed a significant increase in mast cells, inflammation, inflammatory cells, alveolar thickness, vascular thickness, pulmonary edema, and fibrosis in G2 when compared to G1 (P < 0.05). HES significantly decreased inflammatory response, fibrosis, and mast cells when compared to G2 (P < 0.05). Administration of HES resulted in decreased radiation pneumonitis and radiation fibrosis in the lung tissue. Thus, the present study showed HES to be an efficient radioprotector against radiation-induced damage in the lung of tissue rats. 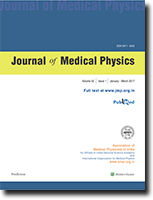 The current work describes the implementation of the American Association of Physicists in Medicine (AAPM)'s Task Group 119 report on a volumetric phantom (Delta4, Scandidos, Uppsala, Sweden) following the stated dose goals, to evaluate the step-and-shoot intensity modulated radiation therapy (IMRT) system. Delta4 consists of diode detectors, lying on two crossed planes, measuring the delivered dose, and providing two-dimensional dosimetric information. Seven plans of different goals and complexity were performed, with individual structure sets. TG199 structure sets and plans were transferred and implemented on the Delta4 phantom taking into account its cylindrical geometry. All plans were delivered with a 6 MV linear accelerator equipped with multileaf collimator of 1 cm thickness. Plan results for each test met the recommended dose goals. The evaluation was performed in terms of dose deviation, distance to agreement, and gamma index passing rate. In all test cases, the gamma index passing rate was measured >90%. Delta4 phantom has proven to be fast, applicable, and reliable for the step-and-shoot IMRT commissioning following TG119's recommended tests. Although AAPM's TG119 report is referring to the implementation of test plans that do not correspond to patient plans, it could be used as an evaluation tool of various IMRT systems, considering the local treatment planning system and the delivery system. Response of Al2O3:C-based nanoDot optically stimulated luminescence (OSL) dosimeter was studied for the dosimetry of 6, 9, 12, 16, and 20 MeV therapeutic electron beams. With reference to ionization chamber, no change in the response was observed with the change in the energy of electron beams for the field size from 6 cm × 6 cm to 25 cm × 25 cm, dose rates from 100 MU/min to 600 MU/min, and the linearity in the response up to 300 cGy. The fading of the transient signal was higher for 20 MeV electron beam than that of 6 MeV electron beam by about 5% as compared to value at 20 min after irradiation. The depletion of OSL signal per readout in 200 successive readouts was also found to change with dose and energy of electron beam from 6 MeV (9% and 12% per readout at 2 and 10 Gy, respectively) to 20 MeV (9% and 16% at 2 and 10 Gy, respectively). The OSL sensitivity changed in the range from 2% to 6% with accumulated doses from 2 to 8 Gy and with electron energy from 6 to 20 MeV, but the sensitivity could be reset using an optical annealing treatment. Although negligible fading for postirradiation storage from 20 min to several months, acceptable precision and linearity in the desired range, and high reproducibility makes nanoDot dosimeters very attractive for the dosimetry of therapeutic electron beams, a note should be made for changes in sensitivity at doses beyond 2 Gy and electron beams energy dependence in reuse, short-term fading, and signal depletion on repeated readout. 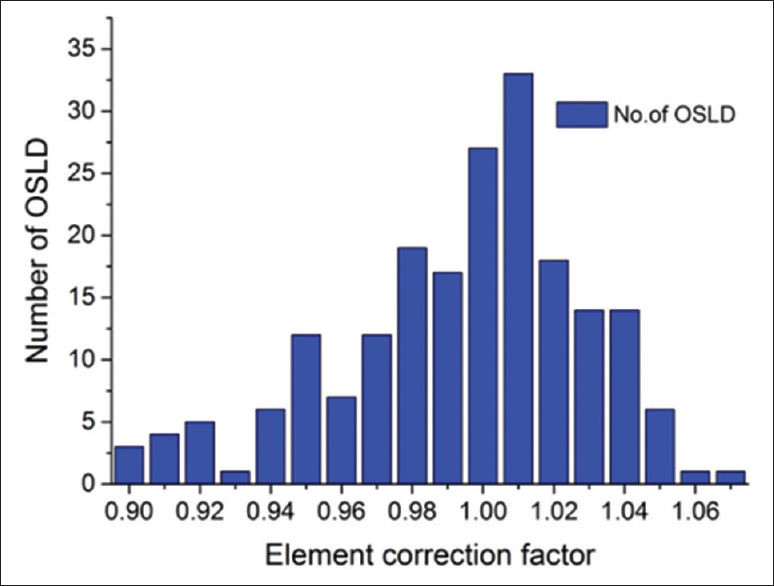 The aim of this article is to assess Tamil Nadu pediatric computed tomography (CT) diagnostic reference levels (DRLs) by collecting radiation dose data for the most commonly performed CT examinations. This work was performed for thirty CT scanners installed in various parts of the Tamil Nadu region. 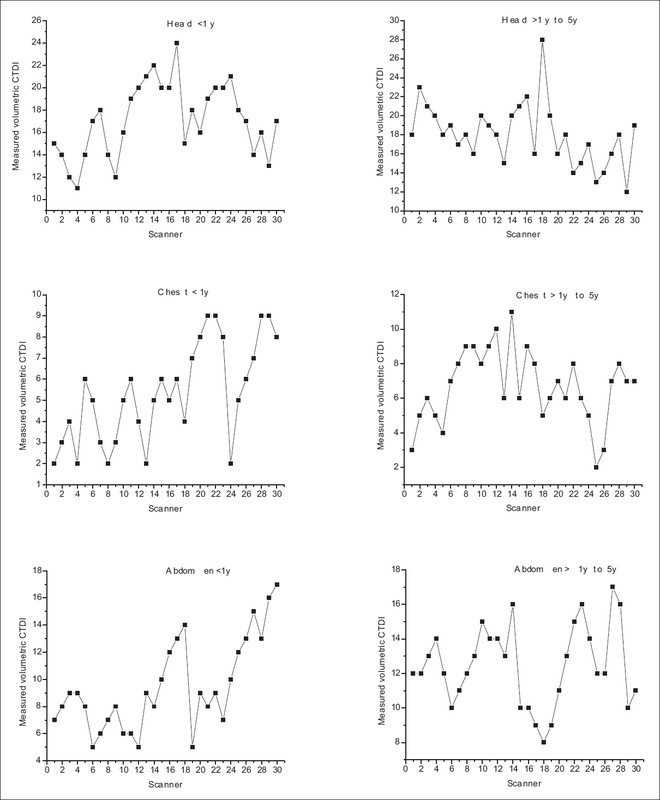 The patient cohort was divided into two age groups: <1 year, and 1–5 years. CT dose indices were measured using a 10 cm3 pencil ion chamber with pediatric head and body polymethyl methacrylate phantoms. Dose data such as volumetric CT dose index (CTDIv) and dose length product (DLP) on a minimum of twenty average-sized pediatric patients in each category were recorded to calculate a mean site CTDIvand DLP value. The rounded 75th percentile was used to calculate a pediatric DRL for each hospital, and then region by compiling all results. Data were collected for 3600 pediatric patients. Pediatric CT DRL for two age groups: <1 year (CTDIvand DLP of head [20 mGy, 352 mGy.cm], chest [7 mGy, 120 mGy.cm] and abdomen [12 mGy, 252 mGy.cm]), and 1–5 years (CTDIvand DLP of head [38 mGy, 505 mGy.cm], chest [8 mGy, 132 mGy.cm] and abdomen [14 mGy, 270 mGy.cm]) for select procedures have been calculated. Proposed pediatric DRLs of CTDIvand DLP for head procedure were lower, and for chest and abdomen procedures were higher than European pediatric DRLs for both age groups.